At the end of 2016, a strategic consultant we work with introduced us to a private equity firm in Boston that had purchased an oil & gas accounting software developer in Abilene, TX. The company, WolfePak, opened its doors in 1986 and like many portfolio companies we work with, had neglected their marketing in favor of product development and sales. Oil & gas accounting software is a highly competitive market, with major players and a roster of smaller software developers, each with well-established brands and more effective websites. Over the years, WolfePak had developed a reputation as “mom and pop” software, and its brand and marketing compounded the problem. We spent the first six months of 2017 working with WolfePak’s management on a new brand and positioning. Together, we determined that the software, customer service and technical support were ideal for specific prospects, whether they were operators, first purchasers, investors or service companies. These prospects, having acquired years of experience with large or multinational oil & gas companies, were forming well-capitalized startups to combine organic growth with acquisitions. 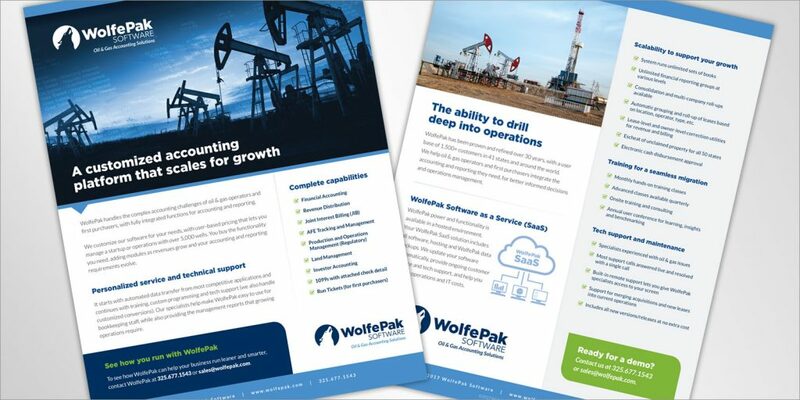 WolfePak’s integrated accounting and reporting platforms offer user-based pricing, for the capabilities of much larger operations, plus the ability to add specific modules for evolving accounting and reporting requirements. These strengths, together with highly rated product specialists, customer service and technical support, formed the heart of our new positioning line: Growing companies count on WolfePak. The new brand and website launched in September 2017. WolfePak named a new CEO in October 2017 and a Texas-based marketing firm came with him. Our engagement complete, we parted on good terms. Our logo design built on the original logo, simplifying it to make more iconic and easier to reproduce for various applications. 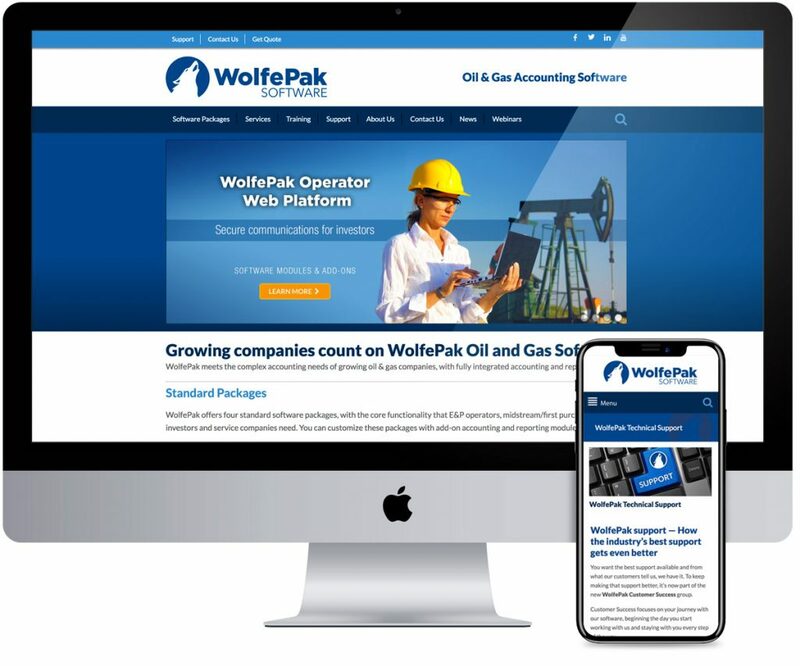 The new site provides a deep dive for prospects, addressing their specific accounting and reporting requirements, while emphasizing WolfePak’s value adds — data conversion and installation, training, customer service and tech support. 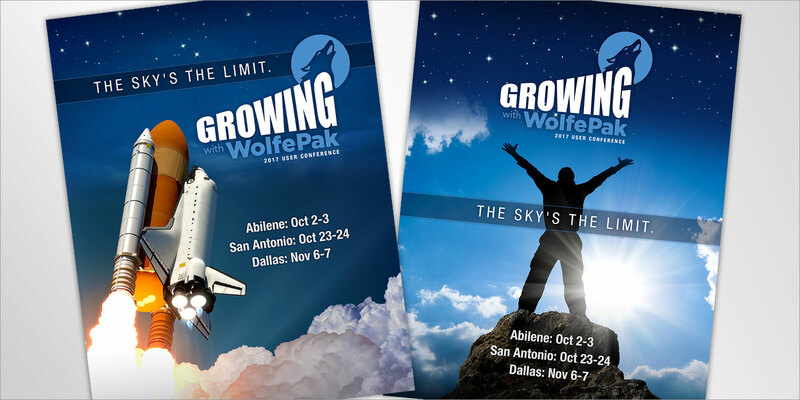 We developed a fast-turn sales sheet for a small regional tradeshow, giving the WolfePak team the opportunity to test-drive our recommendations with key prospects. WolfePak started hosting annual user conferences in 1991 as part of its training, to make sure user abilities would continue to grow with their WolfePak system. Today, these conferences are held in three locations and have become popular industry events. 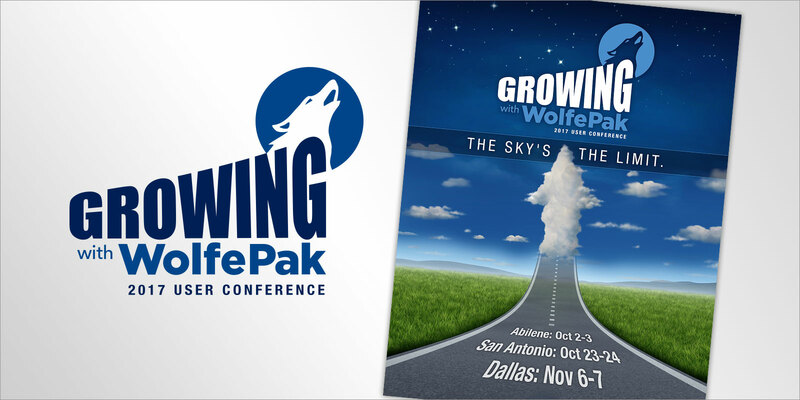 We worked with WolfePak’s management to professionalize their user conference marketing, keeping the company’s energy and enthusiasm, while aligning the messaging with the company’s new brand and positioning.